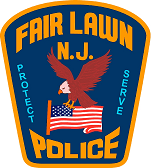 The Fair Lawn Police Department established their Community Policing program in 1996. The methodology behind community policing is to and maintain partnerships between the police and the community. The communication that is built in these partnerships motivates everyone involved in proactive problem solving. Quality of life and community safety is enhanced by removing the barriers between the community and police, through support programs and communication. The Community Policing division is also responsible for press releases, through Sgt. Metzler, FLPD Public Information Officer. Are you interested in forming a Neighborhood Watch? A useful guide from StaySafe.org is available by clicking here. Crime prevention surveys - Residential & Commercial. Great crime reducing suggestions are available! Car seat installations - To schedule an appointment for a free installation, contact Capt. Brian LaRosa, 201-564-6175. Drug Box collection and destruction - Have old unused prescription drugs at home? Drop them off at any pharmacy or at the FLPD Secure Drop Box in Borough Hall. Don't put them in the trash or flush them down the toilet! Borough wide alarm registration and tracking, click HERE to download a new form.